Charles Henry Whadcoat was born in Beeston, Notts in 1891, the third of eight surviving children2 of James William (b. c1864) and Harriet, his wife (née Wolstenholme c1865). James William was originally from Dudley, Staffordshire (then part of Worcestershire) and Harriet from Pentrich in Derbyshire but, it seems, both had moved to Beeston before they were married there in July 19873. By 1891, they were living at 14 Thyra Grove with their then two children and with a lodger4. William was working as a maltster at Beeston Brewery where he continued to work - latterly as a labourer - for the remainder of his working life. In 1901, they were still at 14 Thyra Grove, with their growing family, which included the nine-year-old Charles5. By 1911, however, the family had moved to 12 Commercial Avenue, Beeston and Charles was working as a fork maker for Raleigh Cycles6. As Charles' Army Service Record has not survived, we do not have a precise record of when he enlisted, but it was probably early in 1915 with the Grenadier Guards, joining 3rd Battalion for training, based at Wellington Barracks in London. The battalion as a whole had landed in France on 27 July 1916 to become part of 2nd Guards Brigade of the Guards Division, and from the 25th September had taken part in Battle of Loos, facing terrible conditions and taking heavy casualties7. With the battle continuing into the early part of October, Charles was part of a contingent of reinforcements which was sent to France on the 5th, probably part of a contingent of 63 other ranks joined the battalion on the 11th or another contingent of 65 on the next day. By then, the battalion was in billets near Vaudricourt, in reserve but under two hours notice to move and it wasn't long before it faced further action and the inevitable casualties8. In September 1916, as part of the Somme battles, the battalion took part in the Battle of Flers-Courcelette. The action began with the usual, though much more intense, heavy preliminary bombardment and the subsequent infantry attacks were supported by a new weapon - the tank, used at this battle for the first time. Though few in number, their appearance came as a surprise to the enemy but their slow speed, mechanical unreliability and the difficult terrain were problems that made this early introduction controversial. 3rd Battalion advanced near Ginchy at zero-hour, 6.20 on the 15th September and immediately suffered heavy losses - including 4 officers who were killed9 - on an exposed right flank. Nevertheless the attack made progress overall against heavy enemy machine gun fire which was eventually overrun and silenced. By the end of the action on the 15th, the battalion had beaten back continual counterattacks and had managed to hold its gains. But the cost was very high - in addition to the four officers who were killed, four were wounded and 10 were missing. 31 Other Ranks were killed, 155 wounded and 209 were missing. During 1917, the battalion took part in the German retreat to the Hindenburg Line and key engagements during the three-month long series of bitter battles which made up the Third Battle of Ypres - also known as Passchendae - which began at the end of July. At the Battle of Menin Road towards the end of September, the battalion destroyed the enemy positions and took many prisoners with relatively light casualties of its own. It is not clear from the war diaries how Private Whadcoat died as on that day, the 2nd November, the battalion was away from the front and had been entertained by a concert party in the previous evening. Perhaps he had been amongst thus wounded when the battalion was last in action in the middle of October. At the time, the battalion was near to Saint Python in the Department of the Nord, prior to its later involvement in the Battle of Cambrai. This is consistent with his probable place of his initial burial near to where he is now buried in Anneux Military Cemetery. The village of Anneux is also in the Department of the Nord, a little to the south of the main road from Cambrai to Bapaume. Anneux, Havrincourt and Graincourt were captured by the 62nd (West Riding) Division on 20 and 21 November 1917. Anneux remained in Allied hands until the following 6 December. It was recaptured on 27 September 1918, by the 57th (West Lancashire) and 63rd (Royal Naval) Divisions, acting with the 52nd (Lowland) and the 1st and 4th Canadian Divisions. These six divisions, with the New Zealand Division (which carried on the advance in October 1918), are most largely represented in the cemetery. The original cemetery was made by the 57th Division Burial Officer and by various units in October 1918. At the Armistice it contained 131 graves but was then greatly increased when graves were brought in from the surrounding battlefields and small cemeteries in the area. It appears that Private Whadcoat's grave was one of those moved at that time. 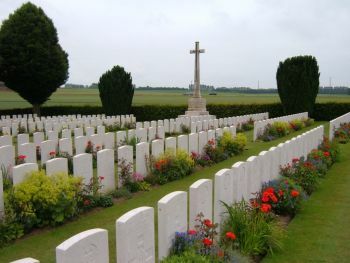 The cemetery now contains 1,013 burials and commemorations of the First World War. 459 of the burials are unidentified but special memorials commemorate seven casualties believed to be buried among them.10. Private Whadcoat was posthumously awarded the British War Medal, the Victory Medal and the 1914/15 Star11. Harriet, his mother died on 1918, aged 5411 and his father, James, continued to live at 12 Commercial Avenue, along with Ethel May, their youngest daughter, who never married. James died in 1942, age 7813. Albert, their youngest son and husband of Gertrude, served with the Grenadier Guards during the Second World War, having previously served with the Guards from 1921-1924 and with the Nottinghamshire Constabulary between 1924 and 1931. He died on 10 April 1941 in Nottingham in tragic personal circumstances and is buried, in Beeston Cemetery, one of 46 casualties whose graves are maintained there by the Commonwealth War Graves Commission. 2His birth was registered in Basford Registration District (of which Beeston was part) in Q4/1891 (Ref 7b 210). His siblings were Elizabeth Fanny (b. c1889), James William (b.1890), Florence (b. c1893), Ethel May (b. c1897), John (b. c1898), Harold (b. c1890) and Albert (b. 1903). 3They were married at Beeston Parish Church on 31 July 1887. 4Beeston, Notts, 1891 Census, Piece 2671 Folio 1119). 5Beeston, Notts, 1901 Census, Piece 3153 Folio 237). 6Beeston, Notts, 1911 Census, Piece 20427 RD429 SD3 ED2 Sched 262. 7This summary of the battalion's early deployment is from its entry on the Forces War Record site (www.forces-war-records.co.uk/units/347/grenadier-guards) along with its War Diary that has been transcribed at 3rdgrenadierguardsww1.wordpress.com, which includes additional useful material. Although the diary for September 1915 has not survived, a contemporary account of the deployment and conditions faced, written by an officer, is included. 8Private Whadcoad's embarkation date is recorded on his Medal Card and in the 1914/15 Star Medal Rolls. The arrival of reinforcing contingents is recorded in the war diary . The diary has also been used for the detail of the battalion's later engagements. 9One of those killed was Lieutenant Raymond Asquith, the son of the then Prime Minister, Herbert Henry Asquith. 11Details from Charles' Medal Card and Medal Roll entries - available on ancestry.com. 12Harriet's death is recorded in Basford Registration District (of which Beeston was part) in Q4/1918 (Ref 7b 484). 13James died on 18 December 1942 (Probate Calendar) in Basford Registration District (of which Beeston was part).